Now this is the fun part, how do you get the performance you want without paying Lenovo quadruple the cost of the part you want in your laptop. You have to use your DIY skills. 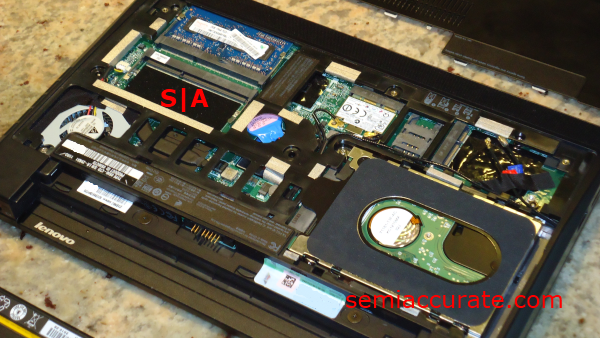 I am by no means a novice PC builder or laptop upgrader, but even if you are, Lenovo’s made it really easy to swap out parts by making the entire bottom panel on the X120e removable. Here is what it looks like with the panel on. And here’s what the bottom panel looks like when removed. 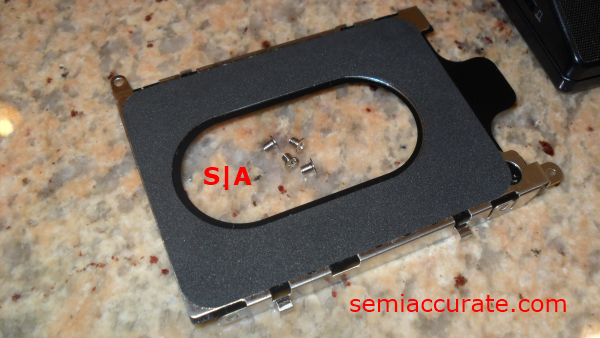 Notice the shiny metal nubs at the bottom that slide into the rest of the case and the 3 black screws at the top. The first, and easiest upgrade, we made was installing an extra 2 GB stick of DDR3 RAM like this one from G.Skill. 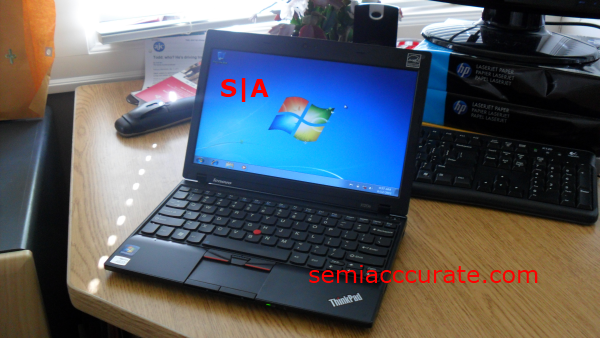 I’ve personally tested for compatibility with the X120e and it works great. 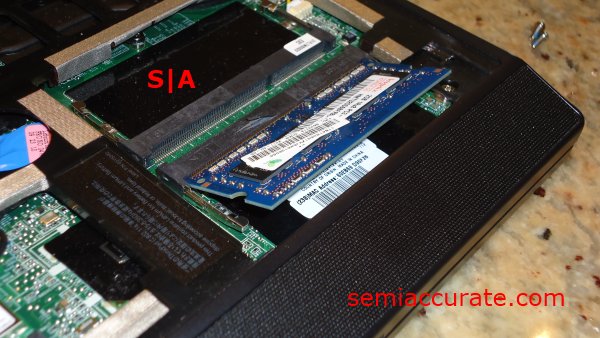 Here you can see the two SO-DIMM slots. They are flat slots that will tilt into an angled slot for user access. This happens when you release the metal clips on either side of the slot by pushing them away from the slot. 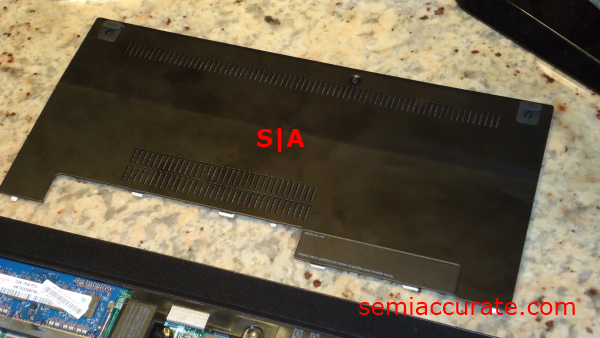 Here’s the stick of RAM installed in the X120e. 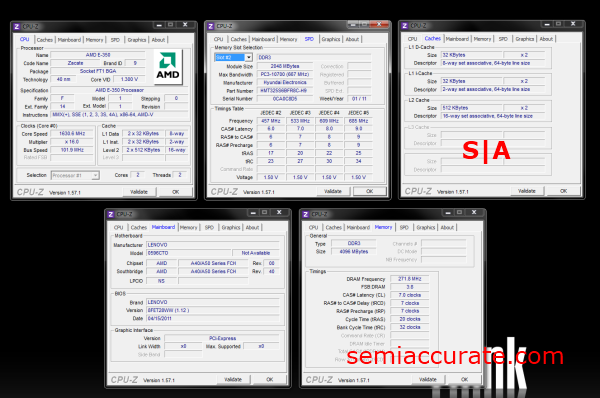 And here’s a picture of it happily running with 4 GBs of RAM. 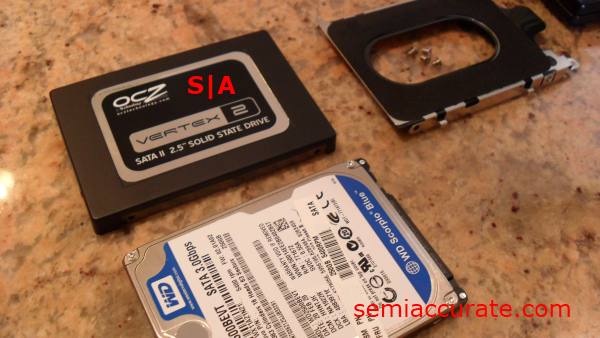 The second most useful upgrade you can do is swapping your hard drive for an SSD drive. The 2.5 inch drive cage in the X120e is an interesting beast. You must first remove two screws which are located diagonally from each other on the top left hand corner of the drive bay and the bottom right hand corner of the drive bay. 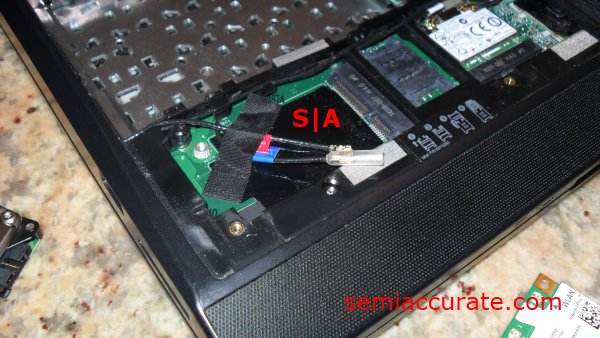 Then you need to separate the 2.5 inch driver from it’s SATA II and SATA power connect slots which are built into the motherboard by pulling on the drive in a horizontal motion towards the outside of the case. 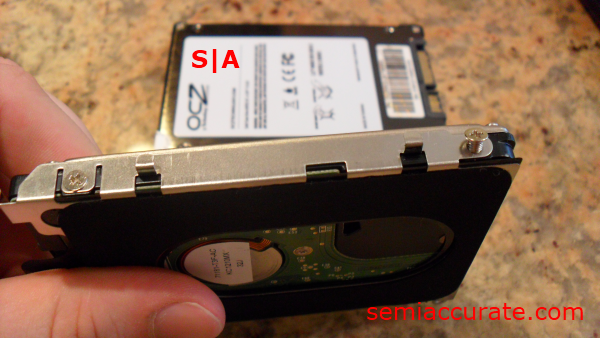 There are four screws near each of the corners that hold the 2.5″ drive bay mount to the physical drive. You need to remove these screws to detach the mount. Here is the mount all by itself; screws, plastic, and all. Once you’ve removed the old drive you can install the new drive by removing the hard drive cage from the old drive and installing it on the new one. 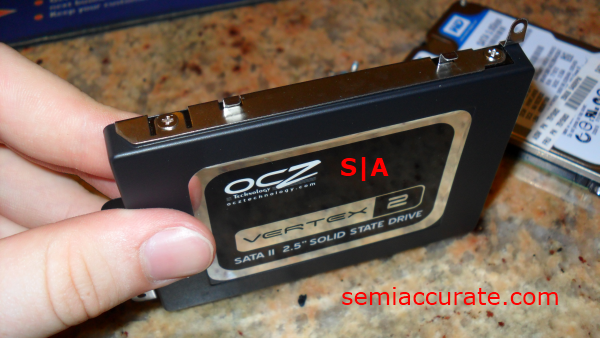 Then inserting the new drive plus old cage into the case and connecting the drive into the SATA II port and the SATA power connector port. 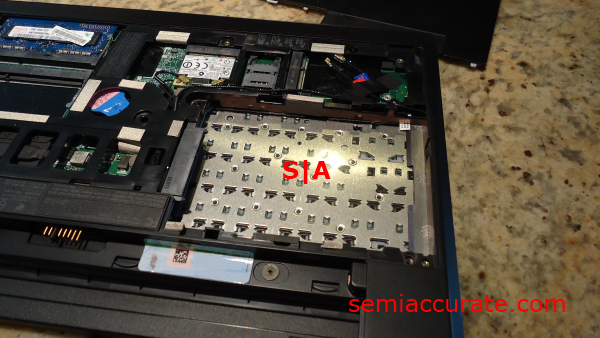 Here is the SSD, in the mount, partially inserted into the X120e. 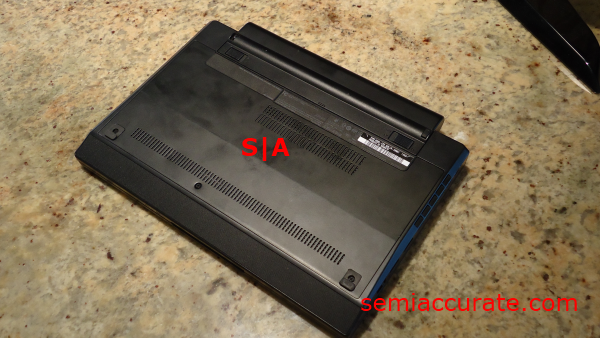 Notice that the SATA connectors near the center of the picture are not inserted into the receiving ends on the X120e. 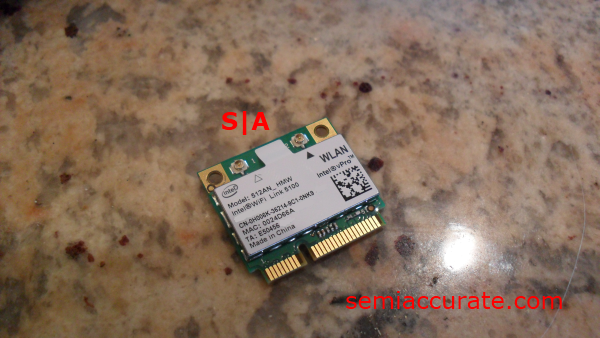 Here’s an Intel wireless chip that was kindly gifted to me by my dear brother. Here’s the inside with everything all done. 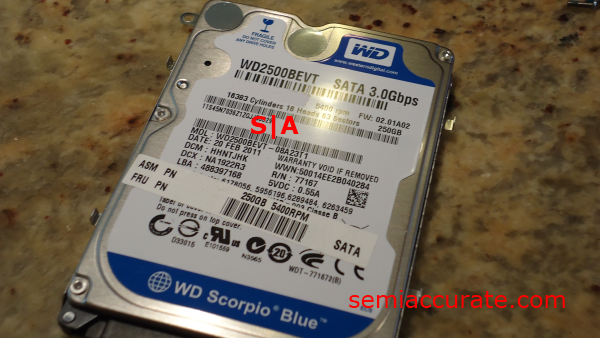 The SSD is connected to the SATA ports, and the secondary WiFi card is in its expansion slot. It even boots Windows 7 after an install via USB.